I tried the 2005 vintage of the Liber Pater. The nose was quite delicious but the palate was thin and overly tannic. When I was in class tasting this wine I said that I would have liked to try a new vintage of this wine because it was quite intriguing on some levels.You have confirmed my expectations. Thank you. Here's to Calabria! I find your observations on wine entertaining and educational. I've never tried this wine, but I think I'll seek it out. 2007 San Francesco Cirò from K&L which was quite good and a value at $13. Nicodemo Librandi makes a good Cirò at a good price. Librandi is worth looking into--he's a true pioneer in Calabria, and his vineyards are planted with all kinds of exotic vines native to the region. Thanks for the find--I'm always looking for new, uncommon wines...especially Italian ones. 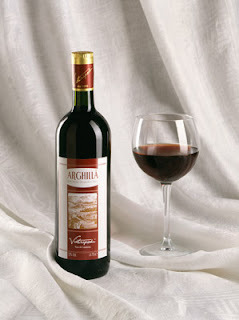 I love the lesser known Italian wines produced in the smaller, lesser-known, southern regions. Calabrian wine sounds like my palate's kind of wine--I'll look for them. Wow! It's a romantic view. A good wine that you really run into.